Well, not just your displeasure—the entire world's. 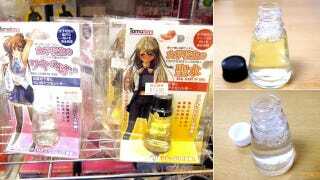 In Tokyo's geek district Akihabara, adult novelty toy maker Tamatoys is selling "schoolgirl urine scent" and "schoolgirl armpit scent". Previously, Tamatoys sold bottled schoolgirl smell. It also sold striped underpants for cross-dressing men. These latest products claim to be the "real scent of girl", created by a "scent specialist" and offering a "realistic" odor for those who can stomach the scent—or the idea of the scent, or the idea of buying the scent, or the mere concept of these goods. If you are going "what the hell" right now, do not feel alone. People in Japan are thinking the exact same thing. According to Akiba Blog, which smelled both scents, the pee fragrance was "fruity", while the sweat one was, well, the stinkier of the two. Both are priced at ¥1,480 (US$19) at Akihabara's Lammtarra, the scents are adult gag gifts that will probably do just that: make you gag.